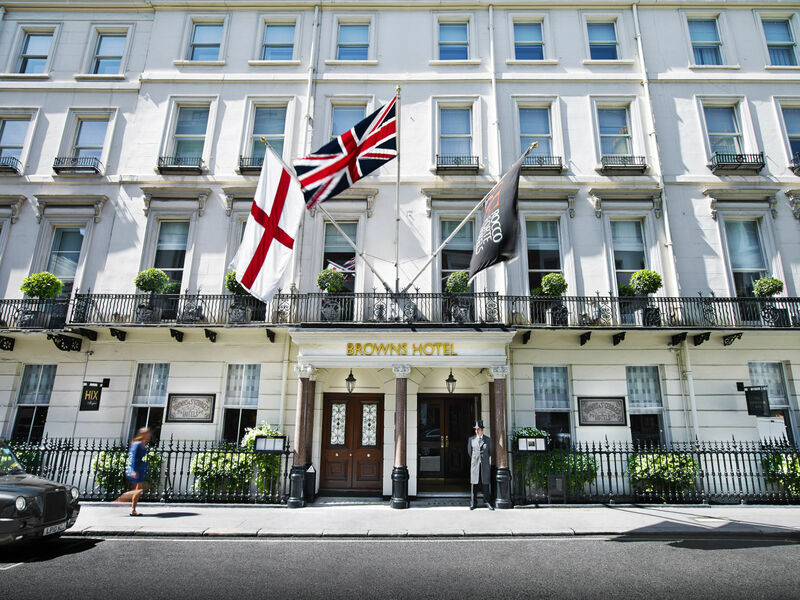 Hugh was asked to provide guests at Brown’s Hotel with a few pointers for their stay in Central London, as well as insights into some of his personal favourites. Edited versions appeared in The Standard and also in Town and Country magazine. Favourite place for brunch/breakfast in London? Dean Street Townhouse has the perfect brasserie atmosphere for brunch, bustling but laissez faire. Their Bloody Mary, plus avocado on toast with a poached egg on top, is a favourite. Sit at a table on the street-side wall and you can take in the long bar, the cheek to cheek settings in the middle of the room, and the arc of the booths at the far end. Tucked round a corner are a handful of quieter tables, which exude a sense of velvet calm and are often populated by those who’ve maybe had a bit of a ‘big one’ the night before. Yauatcha, on the corner of Berwick Street and Broadwick Street in Soho – contemporary Chinese, serving the best dim sum. If you can cope with a hit of garlic, try the spicy soft shell crab and whatever else you do make room for the prawn and bean curd cheung fen – it’s fab. Be sure to book a table on the ground floor, unless you don’t mind a subterranean evening atmosphere in the middle of the day, which is what you find downstairs. Quirky and simple? Head for Le Relais de Venise L’Entrecôte, just off Marylebone High Street. The menu is simplicity itself: green salad with an amazing (secret) dressing, followed by steak frites. That’s it. And they don’t take reservations, so get there as it opens or be prepared to queue. Memorable. 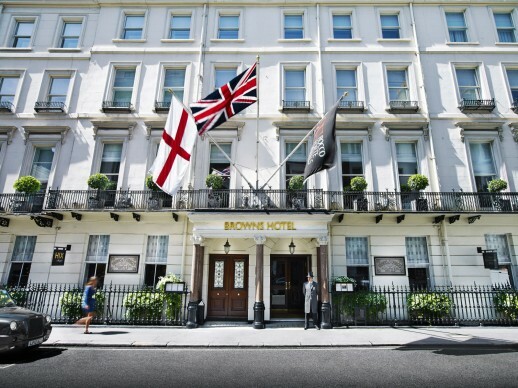 If you don’t want to venture too far from Brown’s (and why would you when you’ve got HIX? ), I recommend 45 Jermyn St. – I think you can guess its address. I’d describe the décor as burnt orange with a hint of retro; as the lights dim during the evening you half expect Sinatra to slide along a banquette and offer Shirley MacLaine a martini (which she’d probably chuck in his face with a laugh). If you really want to indulge yourself, there are three types of caviar, with scrambled eggs to accompany, cooked at your table. The Glenarm Estate Rib Steak is superb. I’ve not yet been for breakfast or lunch but I will. 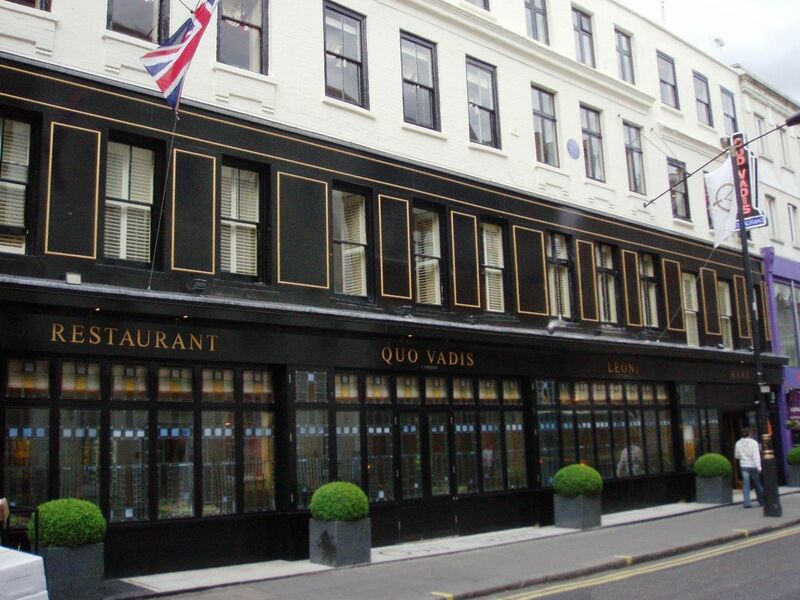 Or there’s Quo Vadis in Dean Street, Soho. It has a really friendly atmosphere and the food is delicious, sometimes even an education: I’d never come across grilled ogleshield before (it’s to do with a cheese). If you’re feeling shy, see if the private booth is available… no-one save the staff will ever know you’re there. I’d kick off the evening here at Brown’s, in the Donovan Bar. Giovanni and his team mix a great list of cocktails and are brilliantly attentive. A short walk away is The Lanesborough, a sumptuous hotel, newly re-opened after a grand refurbishment, at Hyde Park Corner. Its Library Bar is good for a nightcap, intimate and friendly, with a remarkable collection of vintage cognacs, some dating back centuries. The Garden Room has a walk-in humidor and a relaxing seating area and bar if you fancy a puff. There are two great open spaces I’m fond of, right on Brown’s doorstep. There’s St James’s Park, with landmarks like Buckingham Palace, The Mall, Admiralty Arch, Horse Guards Parade, Parliament Square and Wellington Barracks dotted around its perimeter. It’s like walking across one of those tins of shortbread biscuits that has ‘London’ stamped on the lid. Or Hyde Park – I like to walk along the Serpentine towards Kensington Palace and be dazzled by the gold leaf of the Albert Memorial. If you don’t need greenery, then get the tube to Westminster and stroll along the South Bank, from Westminster Bridge to the Oxo Tower and on to the Tate – great views across the river, with street food in abundance and myriad cultural diversions, including the ugly but wonderful National Theatre, where I held a spear in several productions in the mid-eighties. But for a memorable day out I’d take a boat to Greenwich. The journey gives you a real sense of a city that grew up dependent on the river. Once you’ve disembarked, there’s Greenwich market, the Painted Hall in what was once the Royal Naval College, now part of Greenwich university; classic Wren architecture. The Maritime Museum across the road is a must, as is the Royal Observatory just up the hill in Greenwich Park; you can stand with one foot either side of the Meridian line, where East meets West. 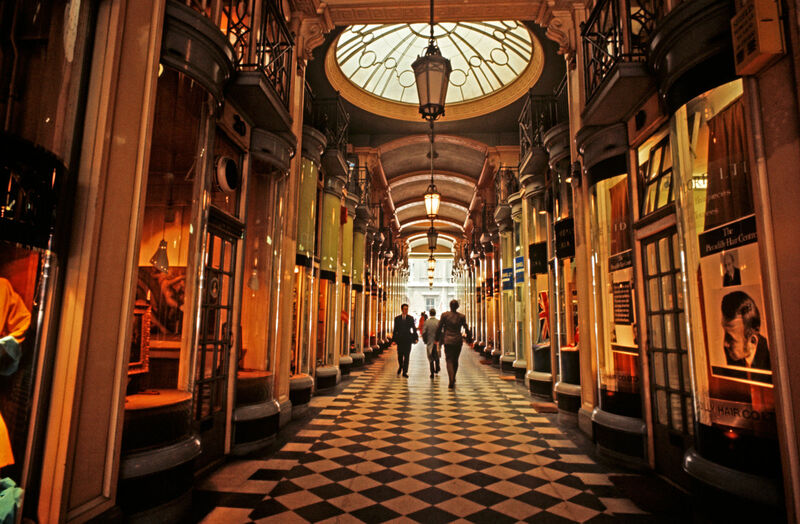 You can’t beat drifting through the Burlington and Piccadilly Arcades for enticing shopping in a gorgeous setting. And I can spend hours in Fortnum & Mason just salivating at what’s on display; it’s a beautiful store, inside and out. A short hop on the tube is Covent Garden. Make sure you seek out Neal’s Yard Dairy, a great place to sniff the air – if you like cheese, that is. Pop round the corner to the Royal Academy, brimming with art, energy and great one-off exhibitions. 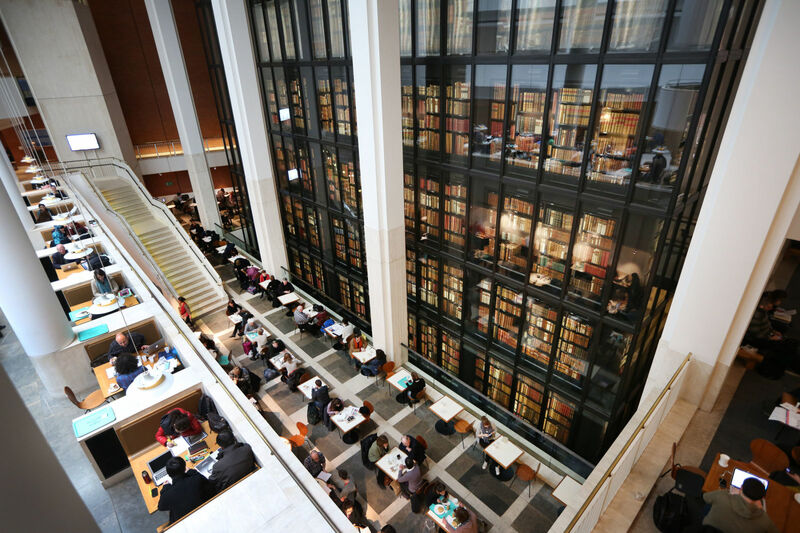 The British Library near King’s Cross is a few stops on the tube and hosts fascinating displays of its treasures. The Museum of Childhood, too – a stone’s thrown from Bethnal Green tube. For a browse through some books in a beautiful building, go to Daunt Books in Marylebone High Street (after lunch at L’Entrecote perhaps?). It may not interest you to know that I helped my old school pal James Daunt stock the shelves when it very first opened. In our world of instant communications and spell checkers, I still like to write and receive hand-written letters. My hand-writing may not be elegant but my fountain pen certainly is. It’s a Cross Townsend Medalist and was given to me by late mother for my fortieth birthday. I absolutely love it: the weight, the battleship grey patina of the barrel, the nib; even the ritual of filling it from a bottle of ink is a pleasure. I find that writing with a fountain pen makes me choose my words more carefully and demands the type of concentration that I all too often lack when dashing off an email or a text message. Do you have a signature accessory? If I’m dressing smart for an evening out I like to wear my Bremont Solo watch. Founders Nick and Giles English recently moved Bremont’s operations from Switzerland to Henley on Thames. It’s a truly British brand, with a strong, confident look. And their stylish flagship shop, a short walk from Brown’s, is worth a visit in itself – a salute to aviators and adventurers from all walks of life. Have you bought any aftershave recently? My favourite aftershave is Gendarme. I came across it in the States a few years ago but have tried in vain to track it down here in the UK. As an alternative I like Richard E Grant’s Jack. 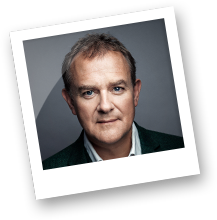 When Richard was a guest star on Downton Abbey he told me about his lifelong obsession with scent – he would often sniff the walls of the set before a take – and I was riveted by his passion for the fragrance he was just about to launch. The Jack scented candle is gorgeous, too. Do you have a creature comfort? I have a wonderfully soft and furry Russian-looking hat, with flaps that drop down to cover your ears when it’s cold. I bought it in the Paris metro in 1980. It cost 20 French francs and I treasure it to this day. What is your favourite book? Why do you love it? When read? My favourite book, probably because it evokes so vividly two of my favourite metropolises, London and Paris, is a Tale of Two Cities. It was the first Dickens book I read, when I was about 13. I grew up in Blackheath, South East London, and the description of the coach making its way up Shooter’s Hill thrilled me, as it was describing a thoroughfare only a few hundred yards from my home. And every time I walk through Soho Square I think of Dr Manette, “recalled to life” and taking a house there after 18 years of hell in the Bastille. What brand do you prefer for luggage? You know that feeling when a favourite piece of luggage gives out? It’s like saying goodbye to an old friend or, dare I say it, having a pet put down. Heartbreaking. Years ago I was given a gorgeous Mulberry satchel that was the perfect size for a script, my laptop and a change of clothes. But by the time it expired, when the zips had been replaced several times and my local saddler had given up on the leather trim, Mulberry weren’t making this particular type of bag. So I began to scour the cities of the world for a suitable replacement. It took years, probably because I had become very fussy: it had to be the precisely the right size, the right colour, leather definitely; the dividing pockets had to be just so; the strap mustn’t be so thin that it cuts into your shoulder… etcetera. Couldn’t find it anywhere. And then one day, on a trip to Paris to promote the movie Paddington, I glanced in a shop window on the rue Faubourg St Honoré and there it was, virtually waving at me. Soft brown leather, perfect dimensions – could call it a briefcase but also capacious enough for an overnight. And as for the shoulder strap? My prayers had been answered. Thank you Berluti. 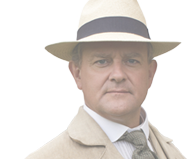 During the first series of Downton Abbey, the Costume Supervisor stitched a label onto the back of my on-set bathrobe which read ‘Hugh’s The Daddy’, a nod to my role as the patriarch of the show’s Crawley family. On a publicity trip to New York that winter I had to go straight from the airport to a press event but no sooner had I arrived than the jet lag kicked in and I genuinely thought I was going to fall asleep before I’d even got on stage for the interview. The audience was already seated and the bar was closing. In a panic, I begged the barman for a shot of tequila and whatever mixer he had left. The Silver Patron and Ginger Ale he served me that night hit the spot perfectly and I bounced into the q & a ready for anything. And thus ‘The Daddy’ was born. One glass is the perfect pick-me-up, two is fun but if you have a third, don’t say I didn’t warn you. Are you interested in art/photography? Do you have any interesting pieces in your collection? While you’re sipping your first Daddy of the evening, downstairs here in the Donovan Bar, drink in also the iconic images created by the photographer after whom the bar is named. No-one captured the spirit of the ‘60s quite like Terence Donovan. I like to take photographs on set using my trusty Nikon but my efforts are not only very modest but also usually blurred. Moreover, these days, with the ubiquity of the camera phone, I know how annoying it can be for crew and cast alike to feel like they’re in a permanent photoshoot, so I’ve eased off over the last few years. Some time ago my wife and I were introduced to the work of the Kenya-based artist David Marrian, whose landscapes are rich in sub-tropical textures. There was one canvas that was so mesmerising – of moonflowers set against an ethereal forest-canopy, stretching into a mountainous distance, hinting at some hidden Shangri-la – that I had to buy it. The painter and printmaker Tom Hammick is another favourite and a woodcut I bought, of a mother and child holding hands as they walk through a wood, always has me lost in its spell.